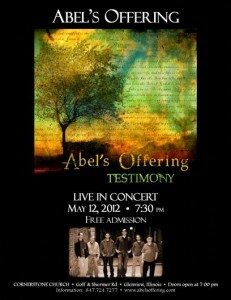 Join Abel’s Offering for a special concert of worship, on Saturday, May 12, as we present songs from our past 10 years and give you a preview of new songs from our upcoming project! The concert will be held at Cornerstone Church, 2 Shermer Road (at the corner of Golf & Shermer) in Glenview. Doors open at 7 p.m. Concert begins at 7:30 p.m.
For more information, visit the Cornerstone Church website or call (847) 724-7277.